I realise that prep and homework are contentious issues in a school – some parents want mountains, others want time with their children, this debate is not new and will roll for years to come. However, one thing that I do want preps to be, wherever possible, is inspiring! Hence, seeing Ria Pau this afternoon as she showed me the work that she has done in relation to her Science prep brightened my day. 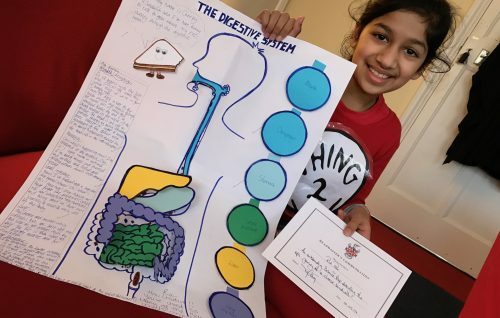 The task was to describe the journey of a cheese sandwich as it travels through the digestive system, and not content to settle with a story, Ria chose to make an interactive display that could be marketed to the educational community for millions! What a stunning piece of work, well done Ria! What a Peach of a Day……..